1. Give each child a plastic cup and get them to decorate the cup with a face. This can either be done by drawing directly onto the cup, or cutting out shapes from paper and sticking them onto the cup. Leave the top of the cup clear as this will be where the grass will grow, looking like hair for the head. 2. Once you have decorated the cup, fill it with soil and sprinkle grass seed onto the top of the soil. 3. 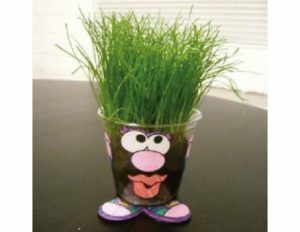 Let the children take home their grass heads and encourage them to water and look after them over the following few weeks. Set a date in the future for everybody to bring them back in and see how their grass head’s hair has grown. Maybe you can have a competition for the longest hair?